* Updated to the 1.11 source code. * Updated to the 1.8 source code. * The font now matches the game's font more closely. * Added region filtering dropdown to Tracked Missions (still no good way to do it for Available Missions). * XP reward line is now shown for all repeatable missions. * Tightened up the spacing between missions in the list. * Fixed clipping issue on the rightmost buttons. * Fixed the scroll-to-top issue for good this time. * Tweaked visibility of buttons so that valid actions should appear regardless of which journal section is active. * Fixed Tracked Missions not updating when a quest is updated while the Journal is open. * Added a Tracked Missions list. Just click the "eye" icon on any repeatable, completed mission to add it to the list. * Something went wrong with the font embedding in the previous version. Fixed. * Updated for patch 1.4. * Yes, I know the scroll issue when expanding/collapsing still exists - I've tried everything I can to fix it, and nothing seems to work. * Fixed font (now contains all characters so words like "Drăculeşti" appear correctly. * No longer scrolls to the top when expanding/collapsing entries. Well, ok, actually it does, but then it scrolls back down. This can be a bit jumpy sometimes, but it's better than having to scroll the window constantly. 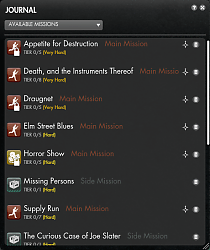 Any chance though you could add in the zone in which each mission is from, maybe even sort the missions into drop downs for each zone or something. 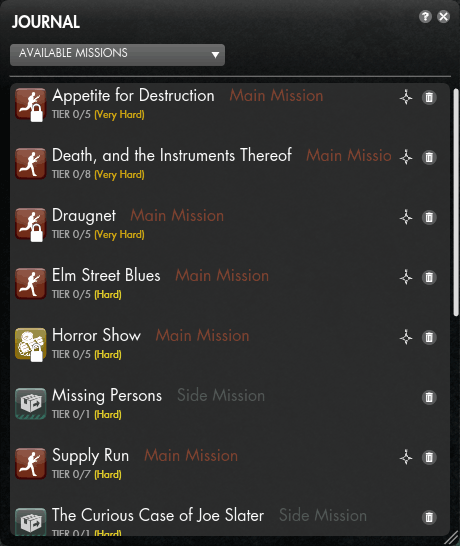 Also have another section which lists the missions which have been added with each new issue and where to find them. This wouldn't update once you have completed them though. Purely for reference only. If you could do that it would be amazing!